Finnish symphonic metal queen TARJA and power metal veterans STRATOVARIUS have joined forces for the European “A Nordic Symphony 18” tour. On 10 October they played Cologne's Essigfabrik club. Expectations were high, of course, as that package promised sheer musical excellence and, above all, a lot of fun. 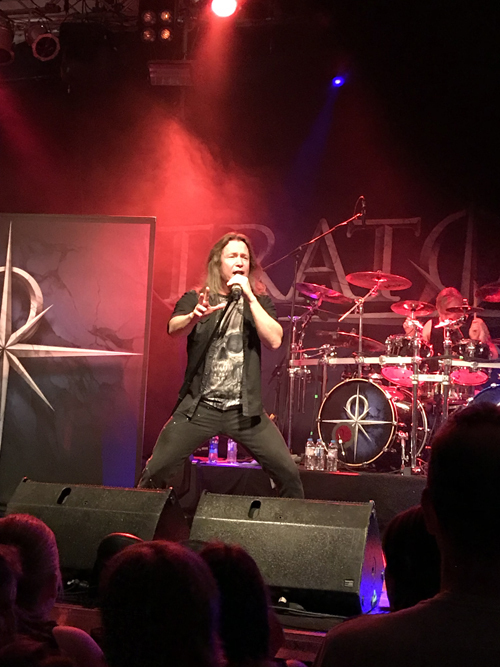 Those, however, who had some lingering doubts as to whether Finland's power metal flagship STRATOVARIUS were still the same explosively virtuoso live act they used to be before the departure of their musical mastermind and guitarist Timo Tolkki, had to exercise some patience that night. Admittedly, this KNAC.COM writer was one of them. It may have been down to the usual horrendous traffic around Cologne or to the unusually warm autumn evening with temperatures of 25°C/77°F that only a few hundred people had assembled in Cologne's Essigfabrik club, which holds up to 1,500 people, when SERPENTYNE opened the evening at 19:15. Indeed, the number of people in front of the stage was quite modest and those who had chosen to sit outside and have a beer may have even made the wiser choice. The five-piece from London, UK, play folk-infused symphonic metal, which is clearly inspired by medieval music and aesthetics. While this sort of thing is definitely popular among those frequenting medieval markets in Germany, the majority of the STRATOVARIUS and TARJA fans didn't show too much enthusiasm, especially at the beginning of the set. The sound was muddy and singer Maggiebeth Sand's classically trained voice didn't really cut through the mix properly. Unfortunately, she sounded quite flat on occasion and the band's overall lack of stage presence didn't really help to win over the crowd, even though the first three rows were clearly enjoying themselves. Things got considerably better when background vocalist Vaughan Grandin exchanged the vocal mic for bagpipes and his bandmates got out bodhráns (frame drums), turning an otherwise uninspired symphonic metal gig into some sort of Irish/Scottish style pipes and drums show. Particularly stunning was the ensuing bagpipe/lead guitar duel. At the end of SERPENTYNE's set, there were definitely more people in front of the stage and the band got a well-deserved cheer from the audience. After a short changeover, during which the hall got considerably more crowded and the space in front of the stage more occupied, the lights were dimmed and STRATOVARIUS' intro was played. The five-piece opened their 70-minute set with “Eaglehart” from the 2003 album Elements Part 1, followed by “Forever Free” from the 1995 release Fourth Dimension. 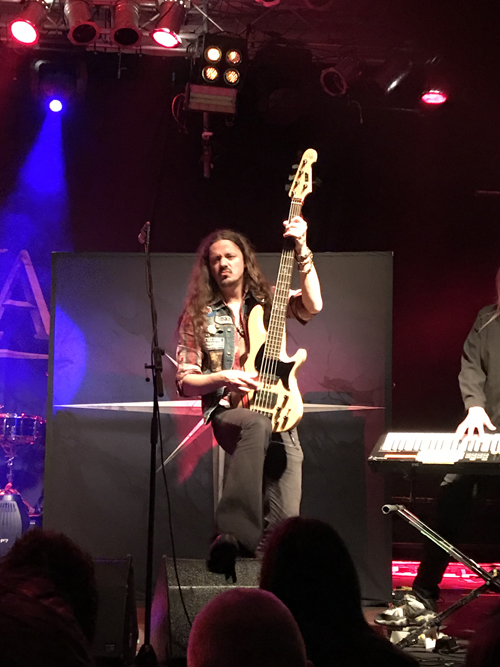 Right from the start of the show, the Finnish power metallers came across as energetic, leaving not a trace of a doubt that they were still up for it. Singer Timo Kotipelto's initial struggle with the odd high note isn't really worth mentioning, given the enormous difficulties of STRATOVARIUS' vocal lines. He and his bandmates certainly had their crowd's back from the moment they hit the stage, which was not only due to the superb musical performance of the quintet but also because of Timo Kotipelto's stage presence. With often one foot on his wedge monitor, he mastered the material with ease while his band proved that STRATOVARIUS are still far from being has-beens. Their set was a cross section of their back catalogue, which by now comprises 15 studio albums. Of course, compromises had to be made and there are always songs they could have played instead of others and the 1995 album Fourth Dimension may have been a bit over-represented but the band made the best of it. Having just released a new compilation Enigma: Intermission II, the Finns performed one of the three new songs from that album, “Oblivion”, which worked out tremendously well live. 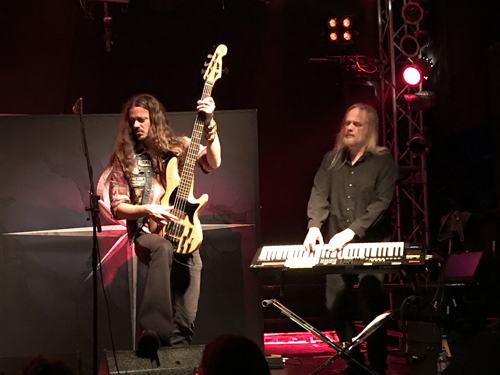 The baroque harpsichord intro to “Diamond” gave Timo Kotipelo the opportunity to introduce STRATOVARIUS' keyboard legend Jens Johansson, whose virtuoso keyboard shredding skills matched those of guitarist Matias Kupiainen, who joined the band in 2008. There was indeed quite a lot of shredding going on but it wouldn't have been a proper power metal show without an emotional ballad, which came in the shape of “Forever”, performed after the thirteen-minute epic “Destiny”. STRATOVARIUS then turned it up a fair notch again with “Unbreakable” and concluded their set with the eagerly awaited “Hunting High And Low”, which they played in a somewhat extended version including a stunning solo by bassist Lauri Porra and a sing-along part. STRATOVARIUS left behind a stunned crowd, a lot of fun was had and it was difficult to imagine that anybody would be able to top their performance. 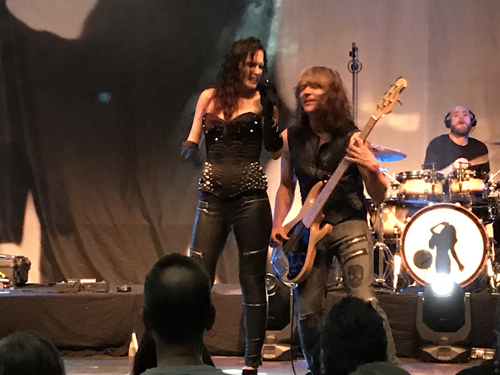 After a longer changeover, TARJA's intro blasted through the PA, and when guitarist Alex Scholpp and bassist Kevin Chown kicked off the funky intro to “Demons In You”, it became clear that TARJA and her band would indeed be the act to top the almost perfect STRATOVARIUS show. 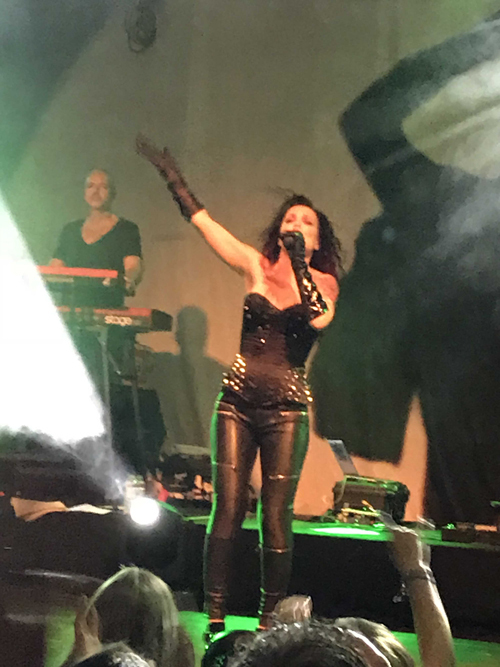 Having seemingly stepped away from her NIGHTWISH past, TARJA's setlist omitted any song of her former band but included fairly recent material, mainly from her last metal studio album The Shadow Self, released in 2016. Having just released her live album Act II, TARJA and her superb musicians Kevin Chown (guitar), Timm Schreiner (drums), Christian Kretschmar (keyboards), Alex Schlopp (bass) and Max Lilja (cello) proved that TARJA can be an enormously heavy act and there were moments when I thought her band stopped short of blowing the roof off the venue. The charismatic mezzosoprano was in top form and it was hard to believe she had just recovered from a cold. She sounded powerful, sang with expression and ease and interacted with the audience occasionally. At some point, somebody in the crowd shouted something in Finnish, to which she charmingly replied – what exactly, alas, only those who understood her native language knew. But back to the music. All the songs were real killers live and the question “but did it djent?” had to be answered in the affirmative every now and then. 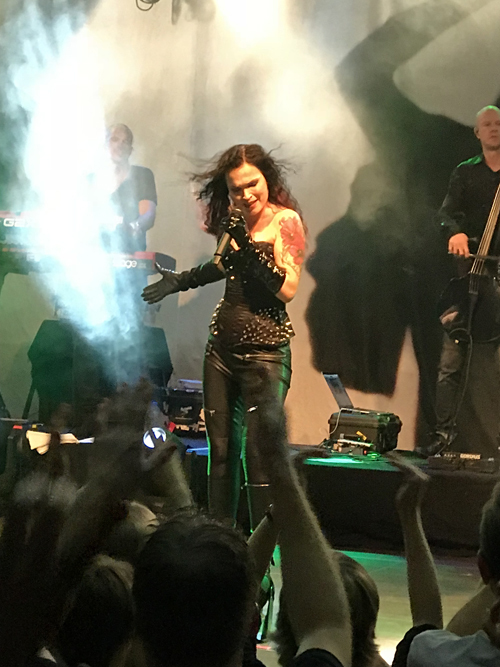 Incorporating a wide range of different styles and moods, TARJA's recent music is extremely versatile and also more modern. Thus it was also more captivating than that of STRATOVARIUS. There were, of course, occasional elements of classical music in her material like the waltz in “Diva” or the distinct rhythm in the opening section of “Victim of Ritual”, known from the “Bolero” by French impressionist composer Maurice Ravel. There was always enough room for her musicians to show their skills and without wanting to single anybody out, I found that the members of her rhythm section played particuarly impressively. 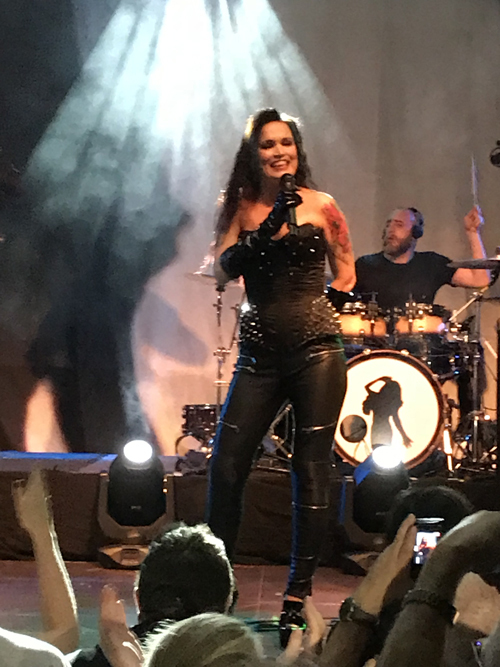 After “Until My Last Breath”, TARJA's 70-minute set was over far too soon and at the end of the evening TARJA and her band left behind a slightly deaf but blissfully happy crowd.